Greyhounds are best known for racing, but they're also lovable companions. It's widely believed that the breed we know as the Greyhound traces its origin back to ancient Egypt, and may actually be a distant relative of the Saluki. These dogs were probably first used for hunting and later herding, which would explain the development of their keen eyesight. This is the reason they are referred to as "sight hounds", because they track game using their eyes, not their noses as a Basset Hound or Bloodhound does. Today, the breed is primarily used in the dog racing industry, a point that will be addressed later in this article. 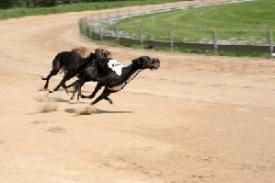 The Greyhound is the ultimate racing-type dog, narrow in build with a streamlined head and long legs. These dogs have deep chests to accommodate the kind of lung capacity needed for sprinting. The top-line is slightly rounded rather than level, and the tail is quite long and thin. The average specimen weighs in around sixty-five to seventy pounds, and stands approximately thirty inches tall at the withers. All colors and patterns are permissible. These dogs are generally mild mannered and affable, getting along well with their human companions. They seem friendly with other dogs of substantial size, but because of their gaming history and the training received by dogs used for racing, they are not as trustworthy around Toy dogs and other small household pets. Surprisingly, these dogs are actually quite calm and quiet; preferring to spend most of their time snuggled up somewhere warm and comfortable. They're not excessive barkers, and don't display the kind of watchdog instincts that other breeds do. This breed has one of the largest rescue networks of any dog breed, largely due to their involvement in racing. Racers are trained for one thing and one thing only: to chase the lure as fast as they can and win the race. In the past, a racer's days were numbered. Animals who either failed to perform or were no longer competitive were routinely euthanized to the tune of nearly twenty thousand dogs per year. Only a small number were used for breeding once their racing days were over. Thankfully, today those numbers have dropped drastically, and record numbers of retired Greyhounds now get the opportunity to be adopted and have real homes of their own. Some of these animals have old injuries from their racing days, and many will have a tendency to bolt in pursuit of small quarry, another leftover from their previous training. This can make it more difficult to take them on walks or keep them in the yard unless you have privacy fencing. These are just a few of the things to keep in mind for anyone considering an adoption, but many families do find it possible to overcome these issues with patience and persistence. This is why breed rescue programs have had so much success. Whether you purchase a dog directly from a breeder or adopt one from a rescue program, you need to be aware of a few basic care considerations. 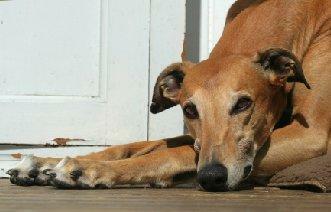 Greyhounds have extremely short coats and no undercoat, so they are very easy to keep clean. Bathing should take place as needed, and unless your pet likes to romp in the mud, this probably won't be necessary more than once a month. Regular nail clipping and ear cleaning will also help keep your pet in good condition. These hounds are extremely lean, which you may have already surmised since their bone structure is so easy to see. They are very susceptible to both heat and cold, so you need to provide some added insulation from both. Avoid leaving your dog in the sun during warm weather, and provide a sweater when the weather turns frigid.There's also another consideration relating to the lack of body fat on these dogs. They carry no padding to comfort their bones, so laying on hard surfaces can be painful for them. To alleviate this problem you should provide a comfy dog bed. Better yet, consider providing an orthopedic dog bed with built in features such as heat and vibration massage. Greyhounds are a beautiful breed, and very deserving of the chance to become members of loving homes. Dogs purchased from breeders are likely to face fewer challenges than those adopted after their racing careers have ended, but both can make loving pets in the right homes.If you're up for the challenge, there's one out there who needs you.